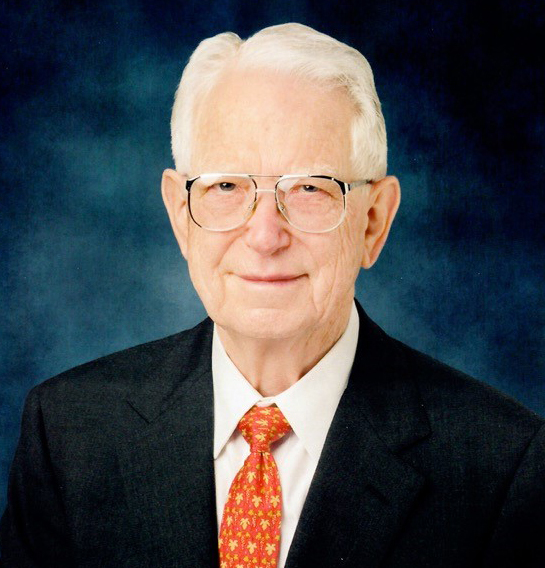 BOSTON—Robert Blair Stobaugh, Jr., a noted expert on energy, international business, and corporate governance passed away on August 14, in Houston, Texas. He is best known for leading a ground-breaking study of the nation’s energy alternatives and co-editing with Daniel Yergin, the 1979 resulting best-seller, Energy Future: The report of the Energy Project at the Harvard Business School. He was the Charles Edward Wilson Professor Emeritus of the school and recipient of its highest honor, the Distinguished Service Award in 2001. Born October 15, 1927, in McGehee, Arkansas, Stobaugh started school in a two-room schoolhouse at age 4, skipped a grade, and graduated from high school at age 15. He earned a degree in Chemical Engineering from LSU, where he was recognized for excellence in the fields of engineering and mathematics. In 1987 he was named to the Hall of Distinction at LSU. Upon graduation, Stobaugh married a fellow LSU student, Beverly Parker, and began his career at the Baton Rouge Refinery of Standard Oil of New Jersey (now ExxonMobil). He transferred to Venezuela, and later joined Caltex (now Chevron) with assignments in New York, Bahrain, and London. The Stobaughs had four children, each born on a different continent. In 1959, the Stobaughs decided to return to the U.S. to raise their children as Americans. Stobaugh joined Monsanto Chemical Company in Houston, where he observed that the top managers, typically with technical degrees, had little training in business administration and economics. Recognizing the importance of business skills, he enrolled in night school at the University of Houston. Encouraged by his professors, he decided to get a doctorate in Business Administration, turned down a Monsanto promotion, and entered the doctoral program at Harvard Business School. HBS invited him to join the faculty in 1967 prior to his receiving his DBA in 1968. During his tenure, he was noted for groundbreaking research and writing in the fields of international business, energy, and corporate governance. He taught courses in those areas, as well as general management, and developed course materials; chaired the Technology and Operations Management area; chaired the Doctoral Program for six years; mentored students in the doctoral program and others doing independent research. On the last day of class, he always gave his students three pieces of advice: 1) Don’t do anything you wouldn’t want to see on the front page of The New York Times. 2) If you borrow money, remember you have to pay it back. 3) Weigh yourself daily and stay the same weight you were in college. In later years as he observed increasingly driven business executives, he added a fourth: Spend time with your family. He testified 19 times before congressional committees and advised White House and Cabinet officers of the Johnson, Nixon, and Carter administrations. Early in his academic career, his detailed examination of foreign direct investment by U.S. companies showed that multinational enterprises had positive effects, not only on jobs and workforce skills, but also on U.S. Balance of Payments, technology transfer, tax revenues, and benefits to Less Developed Countries. His testimony helped defeat bills aimed at restricting U.S. foreign investment. Later he served as president of the Academy of International Business. In 1972 first Arab oil embargo, Professor Stobaugh was before the asked to initiate and direct an Energy Project at HBS to study and compare the various alternatives to the policy of unrestricted reliance on imported oil. He assembled a team of faculty members and doctoral students to produce the unprecedented research. The surprising finding was that conservation would be the most cost-effective alternative source of energy, surpassing the development of coal, nuclear, natural gas, or large-scale solar projects.. The findings of Energy Future: Report of the Energy Project at Harvard Business School, a best-seller, were featured on the front page of the New York Times. The book triggered a 1979 conference on energy conservation sponsored by Harvard University and the Alliance to Save Energy. Attended by political and industry leaders from around the globe, the event concluded at the White House, where Professor Stobaugh presented policy recommendations to President Jimmy Carter. In addition to consulting for corporations, Professor Stobaugh provided advice to the Commerce, Justice, Energy, State, and Treasury Departments, the United Nations, the World Bank and governments of Algeria, Bolivia, Brazil, El Salvador, Indonesia, Peru, and Venezuela. He approached each assignment like an educator, he said, trying to sort out issues, explain and move the country forward. One concept he often conveyed was the difference between optimal and sufficient: establishing priorities for what needs to be optimal versus what can be sufficient is important to both business and government. In 1971, Professor Stobaugh began serving as a director on corporate boards, eventually serving on eleven, ranging from a start-up to a Fortune 100 company. His longest years of Board service were with Ashland, Inc. and Houston-based National Convenience Stores. Internationally he served as an advisor to the Eni Corporation in Milan and to the Inst. Estudios Superiores de la Empresa in Barcelona, Spain. As a director of the National Association of Corporate Directors from 1996-2005, Stobaugh served on blue ribbon commissions, frequently as chair or co-chair, advocating such “best practices” as targets for director stock ownership, outside director majorities, and prohibitions against corporate use of director-owned providers of professional or financial services. After retiring from Harvard Business School in 1996, Stobaugh did expert witness work in corporate governance, particularly in the area of piercing the corporate veil. His longest service on non-profit boards was with the Alliance to Save Energy in Washington, DC, and the French Cultural Center in Boston. Stobaugh maintained a residence in France for 38 years, first restoring a portion of an abandoned, 16th century silkworm factory in Provence, and later moving to a garden apartment in Aix-en-Provence. These peaceful settings and lack of interruption from telephones provided an ideal backdrop for authoring, coauthoring, or editing fifteen monographs and books. These included Money in the Multinational Enterprise, 1973; Nine Investments and Their Impact at Home (1976); Technology Crossing Borders (1984), Innovation and Competition: The Small-Company Board (1996). He also wrote more than 100 articles. Still there was time for pleasure: annual walks across the Pont-du-Gard, an historic Roman aqueduct, visiting the nearby Chateauneuf-du-Pape vineyards, and practicing his French in the markets purchasing melons, cherries, cheese, and baguettes. Stobaugh was blessed with two happy marriages, he often told his friends appreciatively. After forty-two years of marriage, his first wife died in 1990. In late 1991 Stobaugh married June Milton Gray, a widow in Houston with two teen-age sons. To create a sense of family for the children, step-children, and grandchildren, the Stobaughs planned several family trips with all 15 members, including a memorable celebration of the Millennium in London. In 2004, the couple moved from Belmont to Houston, where Professor Stobaugh was for several years an adjunct professor of management in the Executive MBA program at Rice University, with emphasis on corporate governance. He also served Mayor Bill White’s representative to the Board of Trustees for the Houston Firefighters Relief and Retirement Fund from 2006-2010. Stobaugh played tennis until he was 87. In his active retirement, he enjoyed traveling, writing his memoirs, taking courses in politics, and attending lectures at the Baker Institute, the World Affairs Council, and the Council of Foreign Relations of which he had been a Fellow for many years. In Houston, Stobaugh was a member of St. Martin’s Episcopal Church, the Forest Club, several tennis groups, and a men’s luncheon/discussion group. He was a firm believer in church, family and education. He established two scholarships at LSU – one for faculty development and one to promote student leadership. A scholarship named the Beverly and Bob Stobaugh scholarship was established by Harvard Business School for women doctoral students. In addition to his first wife Beverly, and in 2017 by his wife June, Stobaugh was pre-deceased by his parents Robert Blair and Helen Parris Stobaugh of McGehee, Arkansas; a son, William Parker Stobaugh of Los Angeles, California; brother Billy, half-brother, Sammy Farrell, both of McGehee, and a step-grandson Matthew Gray. Survivors include his sons, Robert Blair III and wife Carolyn Stobaugh of Tampa, Florida, and Clay Edward and wife Mary Stobaugh of New York City; daughter Susan Stobaugh Samuelson and husband William of Belmont, Massachusetts; step-sons, Robert Toms Gray IV and wife Lauren of Houston and Geoffrey Milton Gray and wife Ellie of Charleston, South Carolina; grandchildren Robert Blair Stobaugh IV of Los Angeles, California, Field Stobaugh of San Jose, California, Couper Samuelson and wife Julia of Los Angeles, California; Marion Samuelson of San Francisco, California; and Ned Samuelson of Cambridge, Massachusetts; step-grandchildren Whitney and Milly Gray of Charleston; Elizabeth Ryan, Rowan, and Matthew Gray of Houston; and great-grandchildren Henry and Benjamin Samuelson of Los Angeles. A memorial service will be conducted on November 11, 2017 at St. Martin’s Episcopal Church, in Houston. The family suggests that memorial gifts in Professor Stobaugh’s name be made to St. Martin’s Episcopal Church, 717 Sage Rd., Houston, TX 77056; Harvard Business School, or to the charity of your choice.